All Eyes on Augusta! And Don't Forget to Play the Game We Love. Ah, the first full week in April — Masters Week! It's the Rite of Spring that awakens a deep longing in the heart of every golfer. We join the chorus of awe at the spectacle of the tournament at Augusta National Golf Club. It's a joy to behold, and we realize how fortunate we are to be positioned less than an hour away from this incredible event. Don't just watch the greats play golf — get out and play a round yourself! The enthusiasm for the game that the Masters generates is significant. It matters, and the momentum the tournament creates can help sustain a person's interest in the sport for years. We celebrate this crucial tournament! 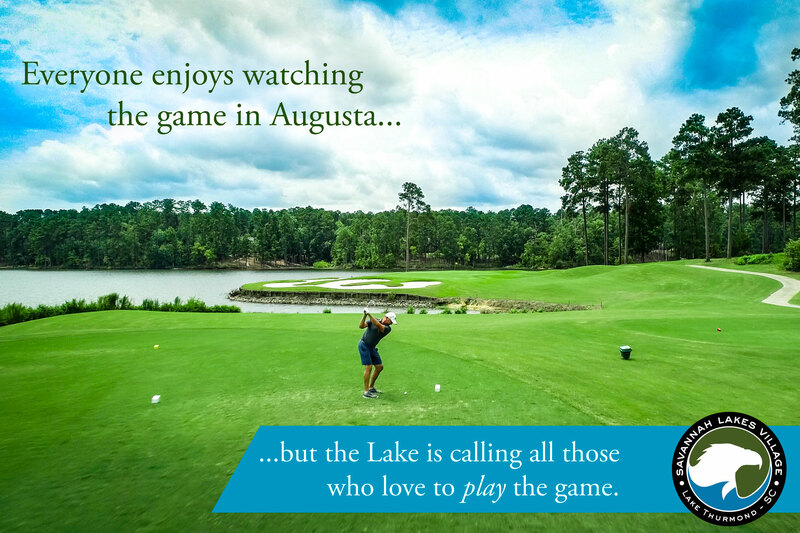 Along with our affinity for the tournament, we are pleased to offer guest tee times at Tara and Monticello, Augusta’s lakefront courses, during Masters Week. Our tee sheets at Savannah Lakes stay filled almost year round with a flurry of member-driven activities and group events. From the MGA/WGA to social groups like MSG9, WSG9 and Golf & Gather, we are a member-focused private community, and our two lakefront golf courses are among our most beloved amenities. Alongside the exclusive experience we offer, we are also welcoming to guest play. In addition to routinely available afternoon and weekend tee times, our members offer guests priority during Masters Week. Whether you live in a golf community in Augusta or you are simply visiting they Southeast for the tournament, tee times near the event are usually pretty tough to find —and when you find them, you will probably find they are priced with a steep premium. That's not what you'll find here at Savannah Lakes. We offer Masters Week tee times for only $99 per golfer. We all appreciate the mystique and legendary appeal of the Masters tournament. It's amazing to be situated so closely to the golf Mecca of Augusta, Georgia! The game of golf wouldn't be the same without it. At the same time, we salute those players who continue to work on their game, hot in pursuit of their best performance and consistent improvement. If you want to add a round of golf to your tournament week itinerary, request a tee time through our Masters Week booking page.